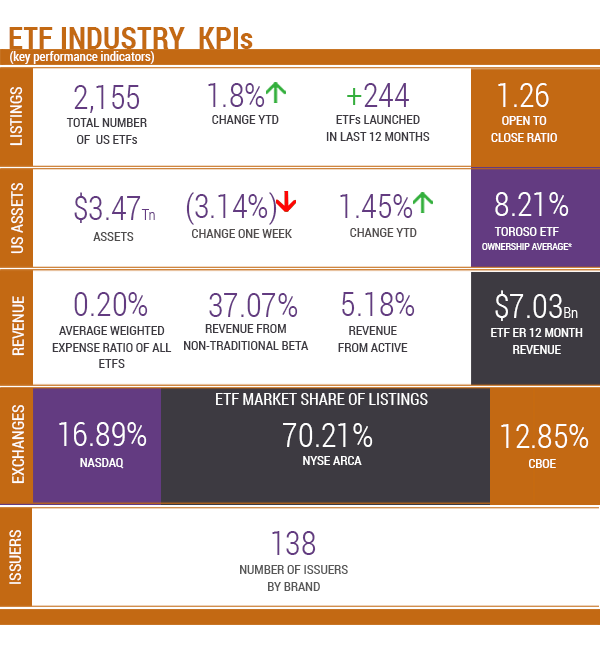 Sometimes, simplicity adds clarity in its presentation of evidence in why we see continued growth in the ETF industry. With that in mind, this week’s message focuses on the ETF market through an analysis of the Top 10 US Equity ETFs and the ownership by the largest 10 Stocks in the S&P 500. The combined value of the 10 ETFs is about $841 Billion or 24% of the $3.4 Trillion in U.S. ETF Assets Under Management (AUM). First, when we focus on these top 10 stocks, it is clear that only shares of Alphabet (GOOG) are above the industry average of 8.21%. This suggests that ETF ownership remains small. Second, active portfolio managers, like Capital Group and even Berkshire Hathaway (BRK), continue to be challenged by the after-tax returns provided by ETFs. Arguably active management also appear to be creating more frictional cost for their stakeholders than ETFs. Third, ETF innovation continues to be driven purely by investor needs for solutions in changing times. Fourth and last, adding insult to the market challenges in 2018, many large mutual fund platforms will be paying out huge taxable capital gain distributions. Therefore, the antiqued mutual wrapper after a 10-year bull market may be set for real vulnerability. In our vision for the current global $5 Trillion AUM market, we see a 20% growth rate over the next 12 years because some of that growth will come through access to different asset classes and solutions: fixed income, core themes, broad multi-asset hedge fund alternatives, and factor-based solutions. According to the 2018 Investment Fact Company Fact Book, total global assets of worldwide regulated open-ended funds in 2017 represented about $49.3 Trillion in AUM. Looking out 12 years, it seems reasonable to see the ETF wrapper representing half of all AUMs; possibly $30 Trillion. Ownership by the Top 10 largest ETFs of the largest 10 companies (by market weight) is mostly at an average range of about 6-8%. Alphabet (GOOG) is at about 11.2% because of its dual share classes is the only exception. (More research to follow on this issue in another Toroso weekly research piece.) Noteworthy is also the fact that Alphabet is owned by 349 ETFs, including multiple different types of based factor-focused ETFs. As the chart below highlights, most of the companies are held by ETFs in the range of 208 to 268 ETFs. The point is that ownership in these large names can grow meaningfully without consequences. Active management has a place, and it moves markets and prices more than broad ETFs. When Warren Buffett’s Berkshire decided to buy 80 million shares in Apple (AAPL), they crossed the 5% threshold with conviction and created momentum for the stock to reach one trillion dollars in market value. Most of the ETF ownership between Blackrock, Vanguard, and StateStreet have stayed status quo since the beginning of the year. Don’t blame ETF ownership for Apple’s decline. Capital Group, including American Funds, is another example of active management. In the latest quarter, the firm aggressively accumulated over 71 million shares Facebook (FB) shares while again the ETF money has stayed the course. These are but two examples highlighted in the activity of the largest companies in the S&P 500, but what is clearer is that actively managed mutual funds in 2018 will surprise many fiduciaries and investors in taxable accounts with meaningful taxable gains. Making changes in anticipation of market cycles and dynamics may make sense, but returns need to be justified and capital gains distribution from mutual funds in the range of 5-38% should provide rational investors with further incentives to allocate further to the ETF wrapper. Importantly, we are not talking small fund family complexes. For example, the Capital Group/American Funds is an example of a $400 Billion fund family that announced distributions in the range of 5-11%. Through our research in the ETF Think Tank, we have also identified other mutual fund complexes that may realize substantial gains. A short list of examples can be found below, but Morningstar’s Christine Benz highlighted this issue when she wrote “More Pain for Mutual Fund Shareholders in 2018. Bottom line: if you are a fiduciary or investor with a taxable account exposed to mutual funds, you must double check your statements and consider ETF alternatives. Returns as of December 10, 2018. As of December 10, 2018. As of December 10, 2018. Source: Morningstar Direct.